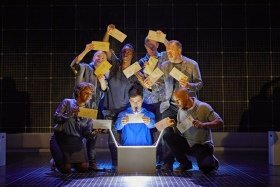 There is a Relaxed Performance of the smash-hit National Theatre production of The Curious Incident of the Dog in the Night-Time this April! actors who will be in costume but out of character. There will be trained and welcoming staff around the theatre for the duration of the performance. The acclaimed National Theatre production is back in the West End For a strictly limited season that must end 27 April. Based on Mark Haddon’s beloved novel and directed by Marianne Elliott (COMPANY, Angels in America) is now playing at the Piccadilly Theatre.